I’ll talk about the story here just to give people some filler space and not accidentally read some spoilery material. 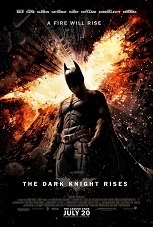 The film picks up eight years after The Dark Knight. Bruce Wayne has become a complete recluse. Crime is almost non-existant after The Dent Act is passed that automatically makes criminals ineligible for parole. Commissioner Gordon is still wrestling for throwing Batman under the bus in the last film and letting him take the fall for what Harvey Dent did. It’s seen as a necessary evil, but he’s having a very tough time living with what he’s done. Just when things are too quiet, Bane comes on the scene and wrecks havoc in Gotham, forcing Batman back onto the streets. As I mentioned at the outset, this film looks GORGEOUS. The film has at least an hour of footage shot in IMAX and these shots make full use of the extra real estate. It’s impressive enough that I would recommend catching it on an IMAX screen if you can just to truly appreciate the scope of the cinematography. The acting is also solid across the board. In my opinion, Anne Hathaway steals the film with her performance as Selina Kyle. My problems with the film come purely with the Nolan brothers and the choices they made in the film. FAIR WARNING!!! THAR BE SPOILERS AHEAD! I’m going to be all over the place with my issues about the film. This is completely ok because the film’s plot is all over the place, so I just look at it as payback. I guess problem number one has to be with Bruce Wayne/Batman. Simply put, this is NOT Batman. He’s whining and pining after Rachel Dawes still. Once his self-sustaining energy project is a “failure”, he goes into hiding and becomes a recluse. He allows himself to become a broken man who relies on a cane to just get around. None of these failings are ever reflected or even hinted at in either the 70 years of comics or even in the previous two films. Batman is an angry man who uses that righteous anger to push him and never stop or give up. This Batman has completely given up on life, and that’s just not Batman. While we’re on the subject of this character, he never gives up. He just won’t settle for a happy ending of a life. It’s one of his failings as a character. That was one of the most BS endings for a character arc I’ve seen in a long time. It’s not that I don’t want a happy ending to my movies, it’s that Batman having a happy ending doesn’t make internal sense with everything that happened in the previous films, let alone in the comics. Next, I have to talk about Bane. To be completely fair, this wasn’t the atrocity of a characterization that happened in Batman & Robin, but this still isn’t Bane. On one hand, I can understand not wanting to translate the idea of Venom giving him super strength because this universe is supposed to be more realistic. However, as you’ll see shortly, that’s a load of crap because this universe isn’t remotely as realistic as in the previous two movies. What made Bane so scary in the comics is that he’s as smart, if not smarter, than Bruce. Add in the Venom steroids and he’s an unstoppable monster. In The Dark Knight Rises, Bane really ends up being little more than a pawn again. He just gets to talk more and break Bruce’s back. As for who the true head of The League of Shadows is, I had that figured out within the first 20 minutes. I don’t think they could have telegraphed that little nugget any more obviously. I’ll actually leave this one alone, but the reveal was a stunt, not a reveal. Nothing happened with the character and that character is freaking great. If there’s one thing that the attacks on 9/11 showed us, it’s that people aren’t ok with idly standing by while waiting for their doom. To portray the citizens as doing precisely both of these things is an epic miscalculation that borders on insulting. I would’ve been ok if there had even been a throwaway line about some people trying to take a stand and how they were dealt with severely. Back to other inconsistencies, the Bane mask just doesn’t work. Even with punching up the audio on Tom Hardy’s performance, there were still several lines of dialog that were completely unintelligible. To make matters worse, Bane’s lines sound like they were recorded in ADR sessions while he was still wearing the mask, so the audio levels are on an entirely different level from everyone else in the movie. It’s so obvious and bad you’d think Tommy Wisseau had worked on this part of the movie. It’s really an example of being so committed to a costume choice that doesn’t work that it doesn’t matter how much the movie suffers as a result. I have to also mention the crack unit of cops in Gotham. How in the world this crew of idiots actually cleaned up the streets, I’ll never know. This might have something to do with the fact that anyone not a detective can’t think their way out of a paper bag and even Gordon issued the brilliant order to send EVERY SINGLE COP IN GOTHAM into the sewer tunnels to track Bane down. How could that possibly go wrong? Finally, we come to the “realistic” nature of this universe. I’ve already questioned the internal logic of Bane taking over Gotham. If you’re going to limit Bane by not giving him the tool that makes him an unstoppable wrecking machine while giving a crucial chink in his proverbial armor, then I’m pretty sure that Bruce’s broken back can’t be fixed by getting punched where his spine is jacked up and then hanging him up on a rope. When the prison doc tells Bruce that he has a freaking vertebrae severely out of place, my first thought was that his spinal cord was severed or badly damaged beyond repair without extensive surgeries. No, no, just let Bones the prison doc sock you on the vertebrae and you’ll be good in a week! So yeah…I’ve got significant problems with this film. I’ll most likely never watch it again. I know I’ve essentially taken a baseball bat to Christopher Nolan for choices made in The Dark Knight Rises, but I still think he’s a phenomenally talented filmmaker. It can’t be stressed enough how beautiful this film is. Most of the action sequences (outside of the Batman/Bane fights) were thrilling and a blast to see on the screen. I’m sure I’ll probably be in the minority as far as my opinion goes, but that’s why it’s my opinion. If you weren’t enthralled with The Dark Knight, you should probably skip this movie. If you’re a diehard Nolan-Batman fan, I hope you find something to like. I’ll admit that was I was slightly disappointed with the film, didn’t think it was as good as The Dark Knight (which I know you also didn’t enjoy). That said, I still thought it was a great flick. I think some of your criticisms are really unjustified, and I’ll explain them here. 1.) “This Batman has completely given up on life, and that’s just not Batman.” You’re pigenholing the character, thinking Nolan has to define him exactly per the comic book version of him that you prefer. But even in the comics, he’s taken on different personalities over the years. And in these movies, I think Chris Nolan has advanced the character, painting a complete person that’s not so one-dimensional as in the comics. I consider this an enhancement, not a detriment. 2.) Bane. Yeah, he made the mask a pain-killer delivery system instead of steroid delivery system. To me that’s potato-potahto (and I’m a huge Batman fan), doesn’t really matter. Regardless, he still made Bane an insane physical specimen capable of taking down the Bat, so it still works. And I don’t agree with you that “he’s little more than a pawn”. Yeah, he ultimately ends up not being THE leader, but he’s still second in command, still the one giving the marching orders to the troops, and I think he comes off as quite intelligent (and played brilliantly by Hardy). I guess I don’t see him dumbed down the way you do. 4.) The Bane mask. I thought the mask was (visually) brilliant, and I didn’t really notice the ADR problems that you did. However, I do agree that there were a few lines that ended up being unintelligle, so could have been done a bit better. Like you said, it’s your opinion, which you’re entitled to, and I think there are some very valid criticisms of the film, which didn’t quite meet my own expectations (though I’ll still be going to see it again, at least once for the IMAX). I just thought some of it was a bit unfair. Well written review Dave! I agree with on pretty much everything. The exception being that I am willing to suspend a little more of my reality for the movie than you are. I have always been a die-hard Batman fan. The portrayals of Bane, Selina Kyle, and that “leader” you mentioned were all done almost perfectly (although I agree the “leader” could have had more to do with it). Overall, despite a few glitches, I loved this movie. A fantastic finale to the series.